A few months ago I warned against the holiday video game buying spree. Since then I ran across this article from BGR.com and this one from Rockpapershotgun.com which gave similar warnings against blindly purchasing games. The writers of these pieces advise their readers to never pre-order games because it is leading to an unhealthy consumer environment. I found their perspective to be mostly accurate, but I think that the situation requires a little more clarification, which is why I am addressing it here. The pre-order market for blockbuster games is certainly skewed in favor of the publishers. Why wouldn’t it be? They have steadily fed gamers with solid games that often take on a life of their own. Shooters like Call of Duty or Battlefield have huge followings because players can customize their avatars and brag about whipping butts and taking names on the field. For a mere $60, there is an amazing amount of entertainment value in these games, even if the downloadable content costs an extra $15. That kind of money is barely enough to take the wife and kids out for a two hour movie, but it buys months of entertainment in the gaming world. It is no wonder that after spending millions, publishing companies want to get their profit out of every game, and the sooner the better! It’s not unreasonable to expect a return on an investment that large. The problem is that the incessant creep of having to do better with each new project causes the publishing companies to make some unsavory decisions. When games were still new, there was a desire to grow the base of consumers—to pull players in however possible. As with most products, advertising was the natural start. What came from advertising was a new niche: the review. The growing popularity of video games brought about a lot of interest and people didn’t have the internet to slake their thirst. In the late ‘80s to mid ‘90s, reviews came almost exclusively from magazines. 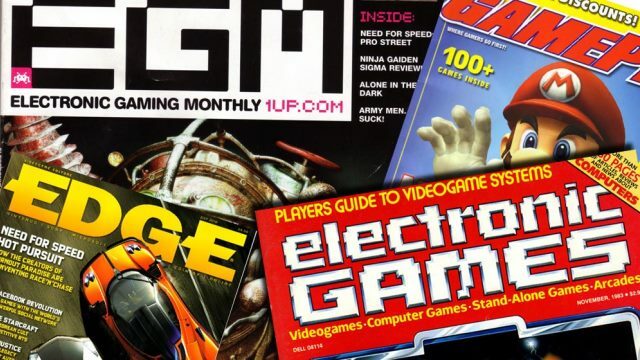 Nintendo Power, GamePro, Electronic Gaming Monthly, and Computer Gaming World all had a symbiotic relationship with the gaming companies who were vying for valuable pages. Enter the problem the big names in games have brought to the current situation: embargoes are being placed more and more often on pre-release journalistic reviews. No articles. No videos. No media of any kind is allowed until a date the publisher determines, which is usually launch day. This allows no time for the fans or potential customers to read about the design, hear an opinion on the strengths and weaknesses, or find out what is fun and also what is annoying about a given game before it comes out. Before it launches to a media blitz to raise hype. Before thousands of gamers who have been whipped into a fury wait in line for midnight releases so they can be the first to experience the game. Fortunately, this has not become the norm, at least not yet. Plenty of reviews can be found for many games before launch day. Some of the bigger media journalists, such as IGN, Gamespot, GameStop or some other similar company can garner an exclusive right to review a game. Even if it is the brand magazines for Sony and Microsoft, Playstation Magazine and OXM respectively that get the exclusive, at least a review is getting published before release day. Unfortunately the trend toward media blackout is growing and this means that reviews come in the form of commercials or game trailers and game websites hosted by the publishers. This is not a healthy path to take, since it leads to a glaring conflict of interest, and that is what I believe my colleagues are warning against. The gaming community is growing. It is on the veteran gamers, such as myself, to teach newer gamers how to be good consumers. This is where I agree with the argument that consumers should not pre-order a game six months ahead of time and give the publisher a false sense of security. If developers know they already have millions of copies sold, they are more inclined to relax the development process and quite possibly deliver an under-developed or, at the very least, a less solid game. Do not reward this kind of behavior! Because the publishers are trying to keep their fans close, they have also created ways for them to easily express ourselves directly to them. Find them on Facebook and Twitter, and their websites. Tell them you will to wait to see how the game turns out before you spend your money on their game. Keep the big guys guessing whether or not they have a hit on their hands because… well, they are keeping us guessing whether we have a hit on ours. Steam will kill video game reviews. Heck were reviews ever useful compared to a number? Yes it is unhealthy to pre order when games will all end up $5 – $20 anyway. Interesting thought. You’re saying that games may end up so cheap that it wouldn’t be worth the time to read reviews? The article focused on the bigger titles with big budgets. Smaller games with no-name start-up developers are a different animal altogether. That being said, the trend toward download-only instead of purchasing a disc at the store will also play a role. The gamer base will just have to evolve with the trends. Another thing about Steam is they have a recommended or not recommended, this yes or no method makes Metacritic useless if 13,000 people have an overly positive review for a game. If Metacritic is rendered useless by enough people, another method of evaluating games will emerge and people will begin using that. Either that or Metacritic will have to revise their methods to adapt to the simplicity of the Steam “reviews”.